It's a ws for pre-intermediate young learners. They should read the sentences and underline the gerunds, and write the type of gerund. The present printable, downloadable handout is a great resource for elementary school students at Pre-intermediate (A2) level. 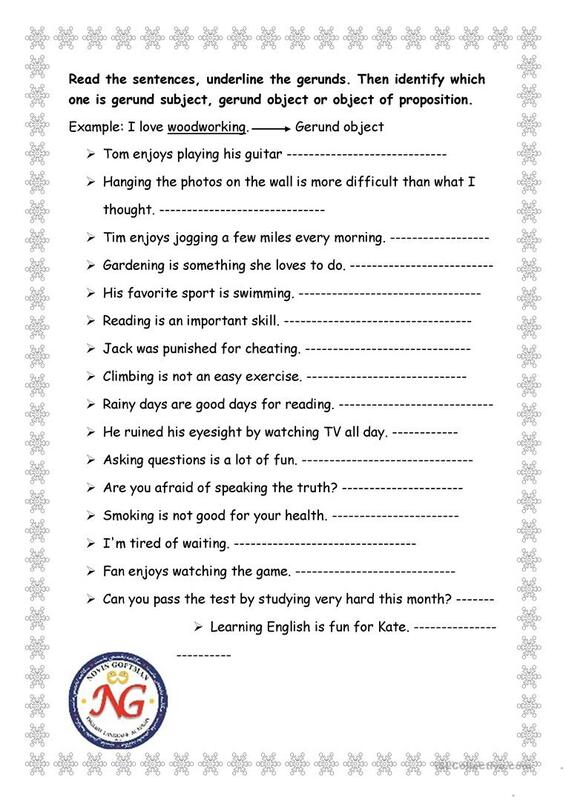 It is valuable for teaching Gerunds in English, and is useful for honing your groups' Speaking and Writing skills. Tonekabon is from/lives in and has been a member of iSLCollective since 2014-12-13 11:29:09. Tonekabon last logged in on 2019-03-04 09:26:29, and has shared 17 resources on iSLCollective so far.